"Orchestrated Customer Engagement: A Use Case Scenario"
Orchestrated Customer Engagement (OCE) has now proven itself to be the next generation of customer engagement beyond Multichannel Marketing and Omni-channel Marketing. 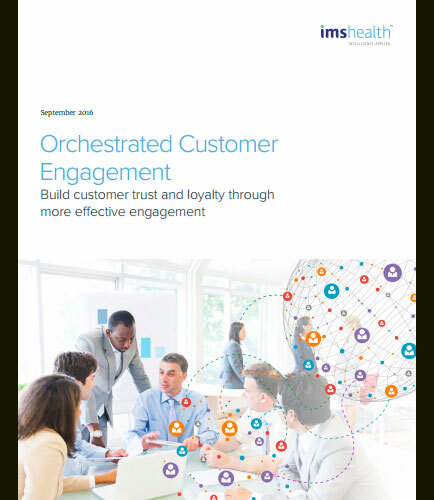 Orchestrated Customer Engagement is an innovative strategy that helps life sciences companies align their sales and marketing functions, integrate customer-engagement activities across the organization, and support it all with a foundation of robust information management. Why do Life Sciences companies need Orchestrated Customer Engagement? Customer Journey Management is defined as managing the customer’s experience from initial contact to final service delivery. Customer journey mapping methodology is used to understand the flow of experiences a customer has with an organization in order to be able to deliver the best possible solution for every unique situation. This descriptive whitepaper is devoted to describe the underlying working methodology of Customer Journey Management and how it can be used to deliver remarkable customer experience. This whitepaper on Customer Journey is a step-by-step guide that looks into ‘’ 3-step Approach to the Customer Journey Management Methodology’’ .It covers: Map the current and define the target Customer Journey Management Process Develop processes to gain insights from continuous data analysis and process re-evaluation while managing the customer journeys Design and implement a solution to achieve the targeted Customer Journey Management process Download this whitepaper that will help you gain the business benefits of Customer Journey Management. Customer Relationship Management or CRM means managing the relationship with your customer. Now-a-days, it is used to describe IT systems and software designed to help you manage this relationship. CRM enables organizations to better serve their customers through the introduction of reliable processes and procedures for interacting with those customers. What is Employee Engagement ? Employee Engagement is an approach to encourage recruits of a company and boost their sense of belongingness within the organization so that they are committed to contribute towards the common goals and values to ensure business success.